Since my Dad and I knew how refreshed we would be after hiking the AT, we decided it would be a good idea to do some day hiking with Mom on Saturday and Sunday in The Great Great Smoky Mountains National Park. After all, we couldn’t let her miss out on all the hiking. 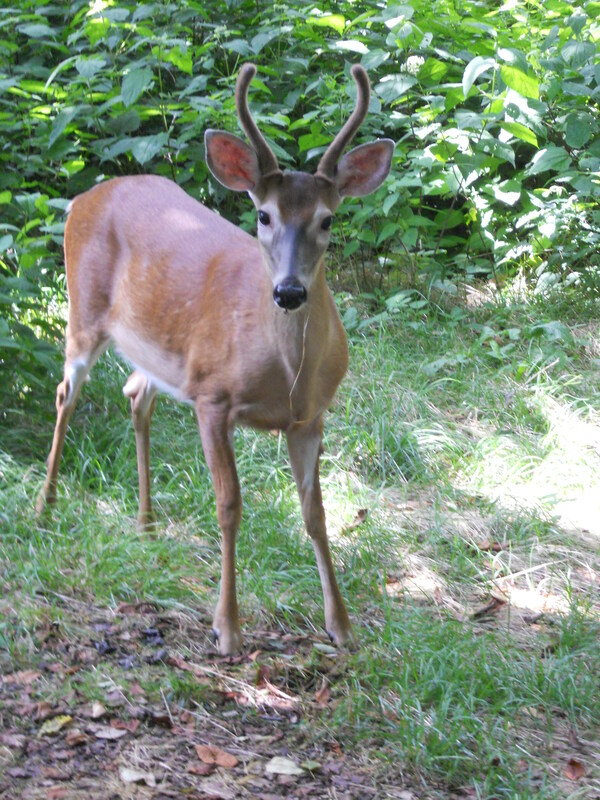 On Saturday morning, we drove to Schoolhouse Gap Trailhead and took the trail a short distance to a little used side-trail that leads to some old cave and mine shafts that have been barred off from the public for safety and because white-nosed syndrome has been found in the area. 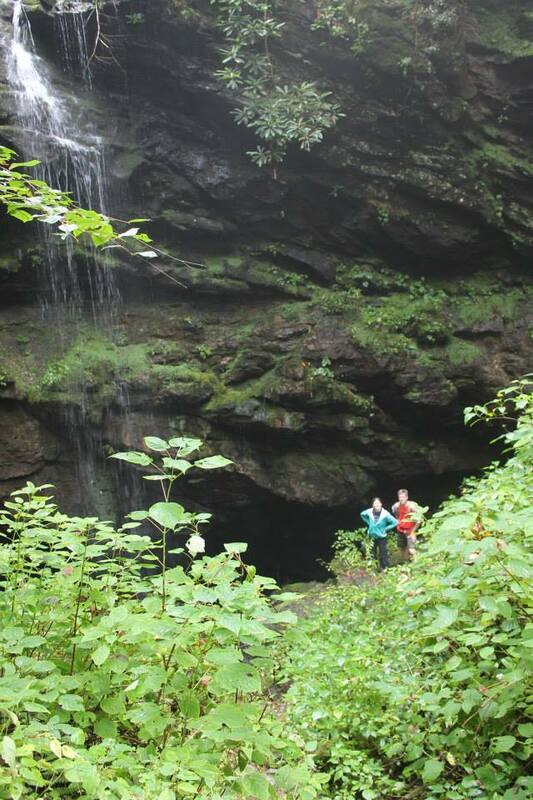 Dad and I by the waterfall/cave entrance. After our hike and a lunch break by the river, we headed to an area in the park known as Elkmont. The area used to be a summer camp for the rich, and there are many remaining run-down summer camps to explore. After a while, it started to rain on us so we headed into town for some shopping and barbecue. 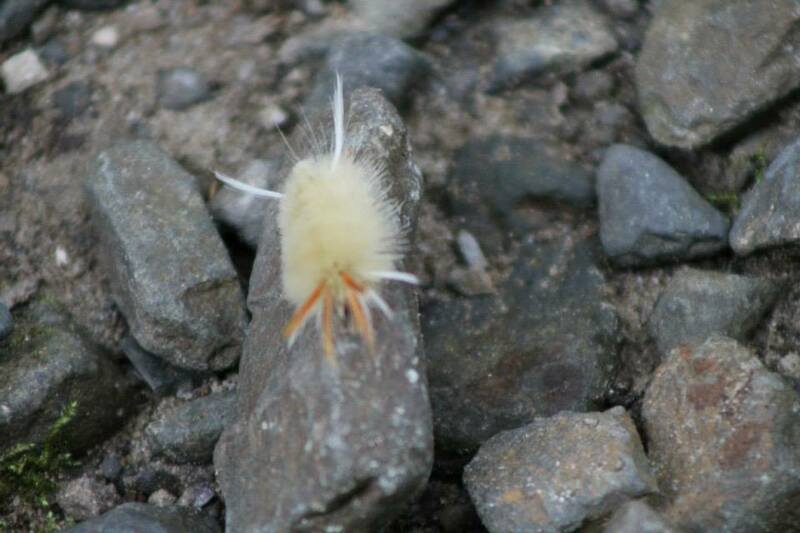 A caterpillar I found on the rocks. 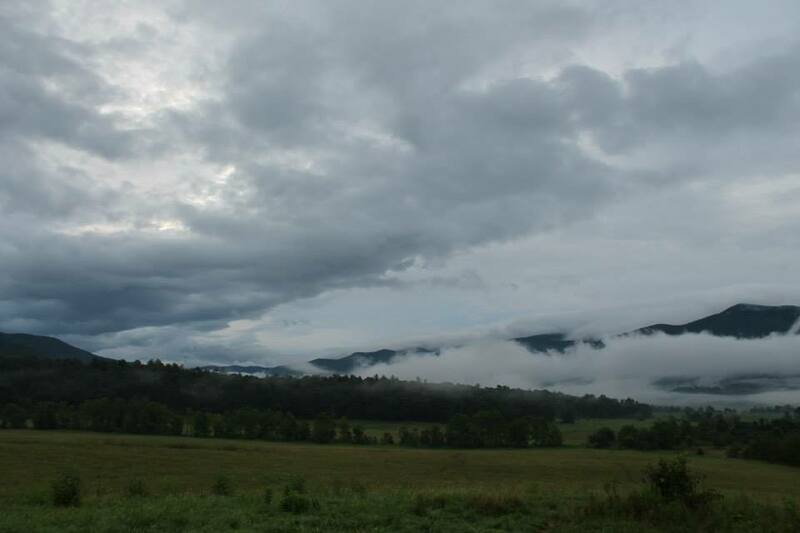 Since it continued to pour all night, we couldn’t drive around Cades Cove at dusk as we would have liked to, so we decided to get up really early and drive the loop at dawn. 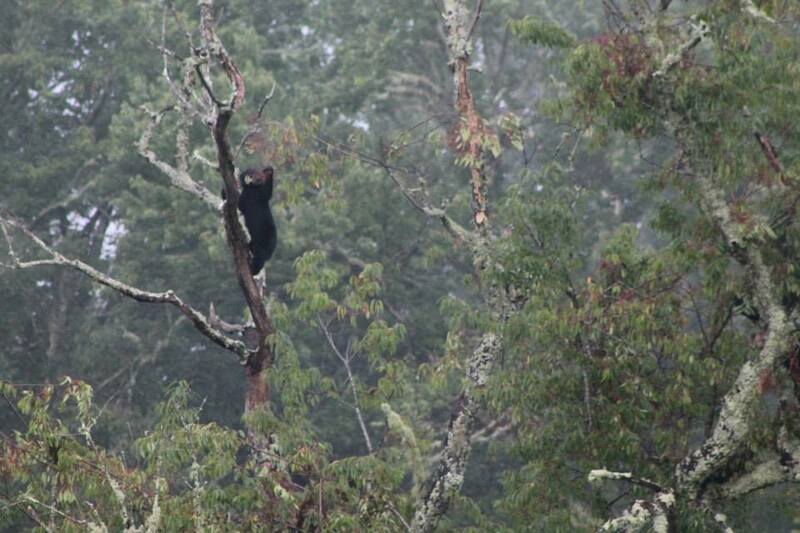 We made a wise decision – partway around the loop we encountered 3 bears, a mother and two younger cubs. 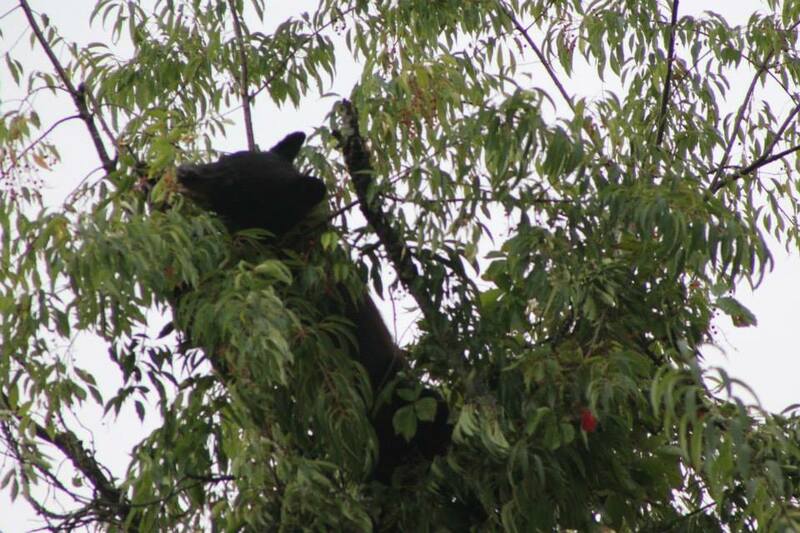 They were all up in cherry trees eating the fruit when we encountered them. 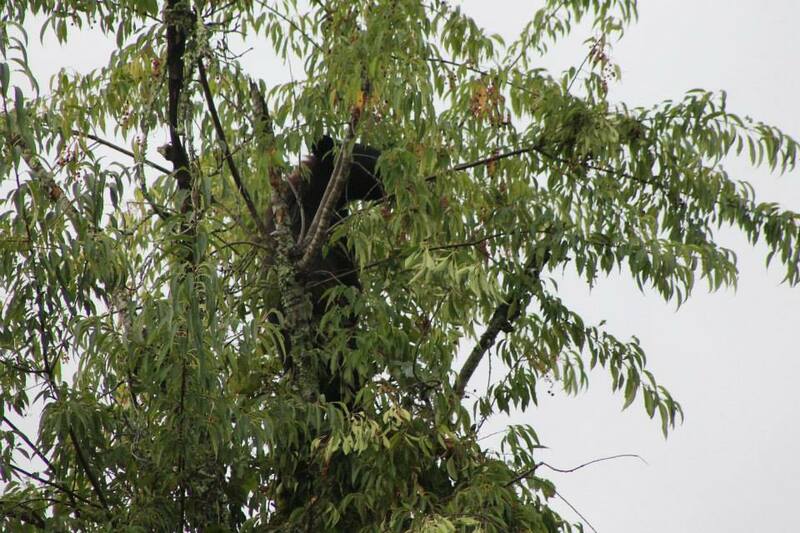 We stayed around and watched for a long time, and they eventually made their way down the trees, walked through a field, before finding more trees to climb. It was so cool. 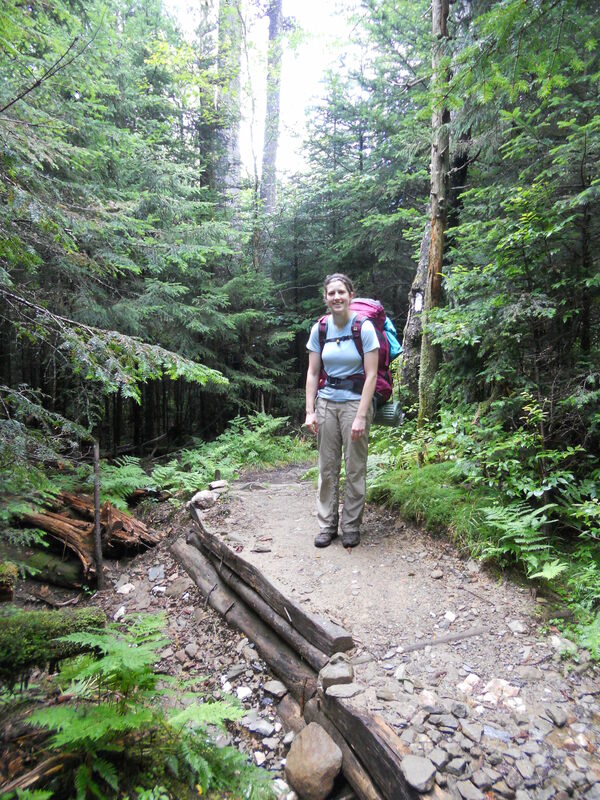 The Appalachian Trail – the 2,181 mile trail that runs from Georgia to Maine – an epic trip attempted by hundreds each year. While my dad and I did not have the 6 months often required to complete the whole thing, we were interested in completing a piece. 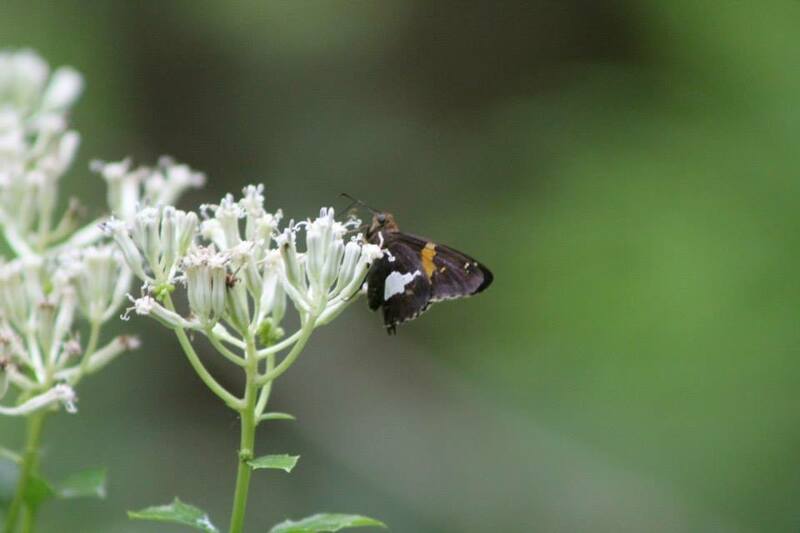 We chose the approximately 75 mile section of trail that runs through the Great Smokey Mountains National Park, and on Sunday, August 11 we began our adventure. We had spent the evening before checking gear and making sure we had everything necessary. 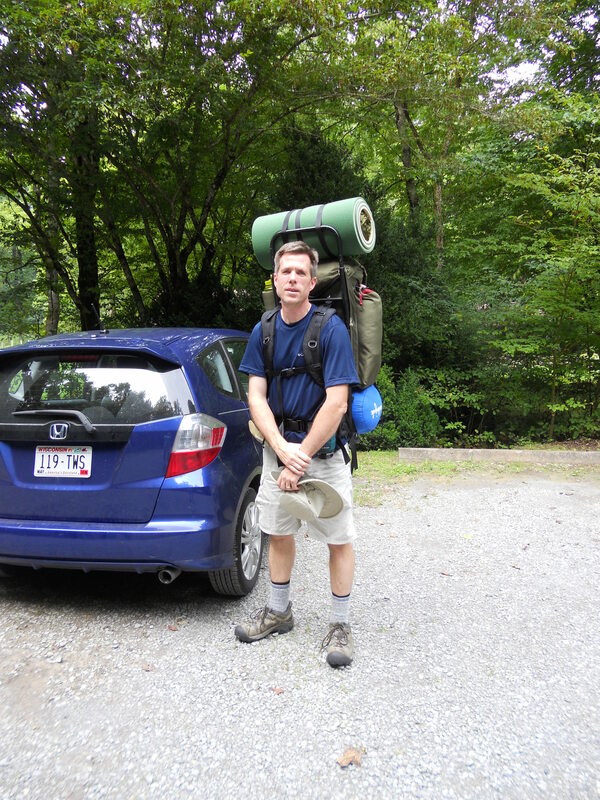 We then left early the next morning to drive to our starting point – the ranger station near Davenport Gap. 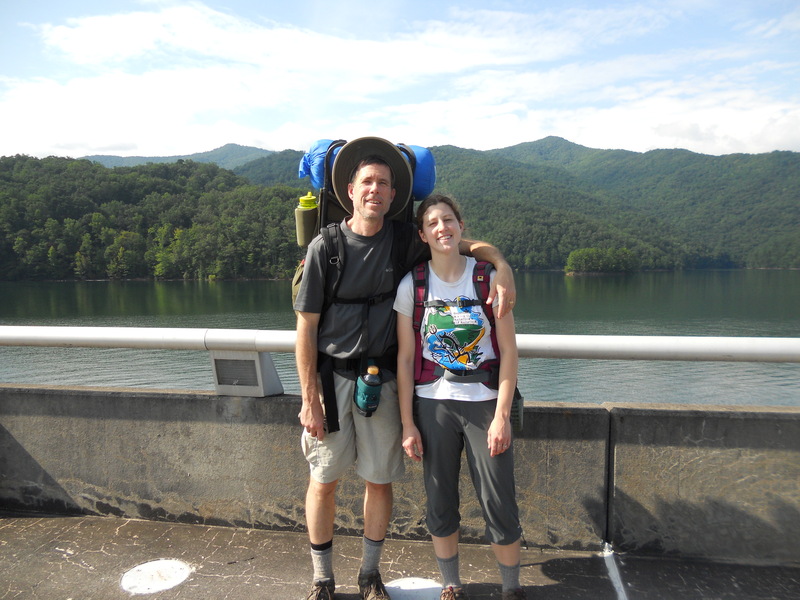 We had arranged to hike from the north to the south end of the park where mom would pick us up at Fontana Dam on Friday afternoon. Dad is ready to hit the trail! We started around 4 PM from our car and hiked about 3 miles up to Davenport Shelter for our first night. This shelter is one of the last remaining “old” shelters, with the fence across the front. The fence is needed because the food is kept inside the shelter with you, rather than being hung on bear lines outside of the shelter. Dad and I ended up getting the place to ourselves, which we both decided was a little spooky. However, we were both happy to have the shelter because shortly after arriving it began to rain…. And rain…. It rained most of the night, but was nice enough to stop before we had to set off the next morning. Monday morning was our first official full day – a really full day – 16 miles of fullness to be exact. 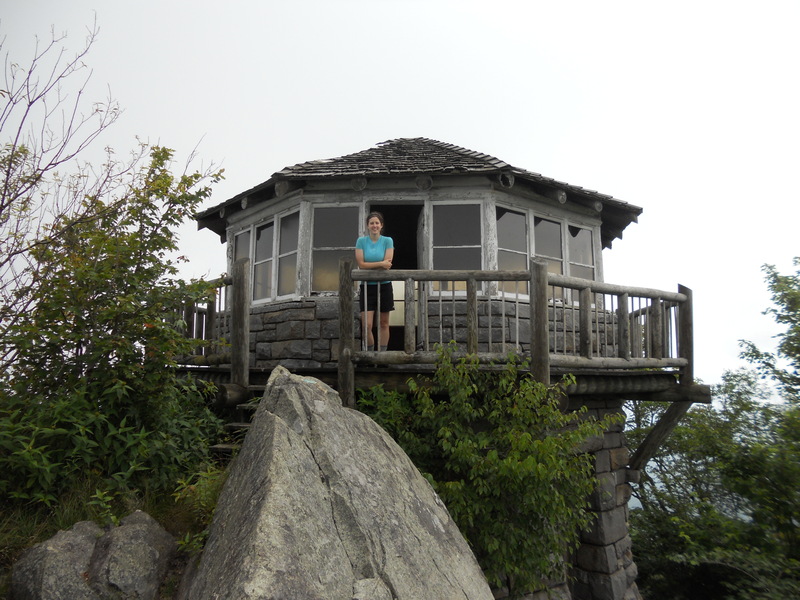 We hiked from Davenport Shelter to Tricorner Knob Shelter with several breaks in between. 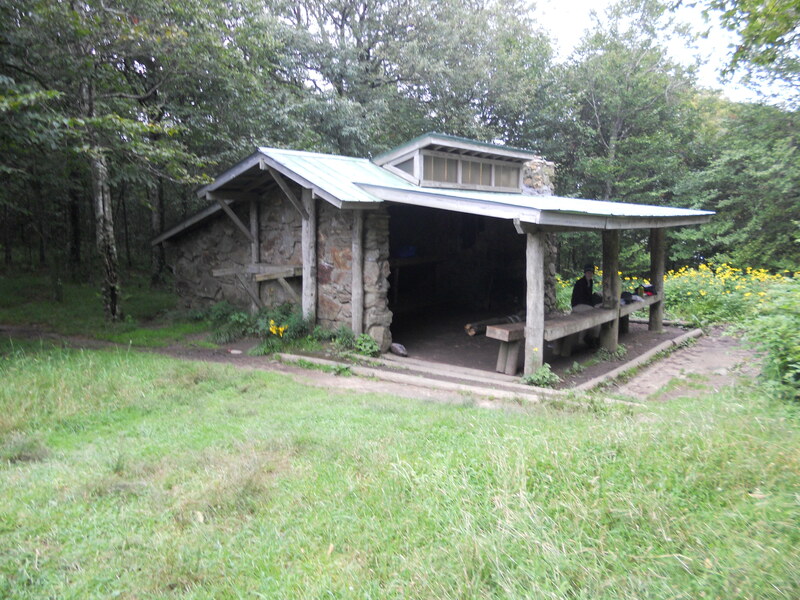 We stopped by Cosby Knob Shelter for a break and to visit the ever rare privy – highly prized break locations for those hiking the AT (really). Many of the shelters had high bear activity signs posted, and this was one of them. 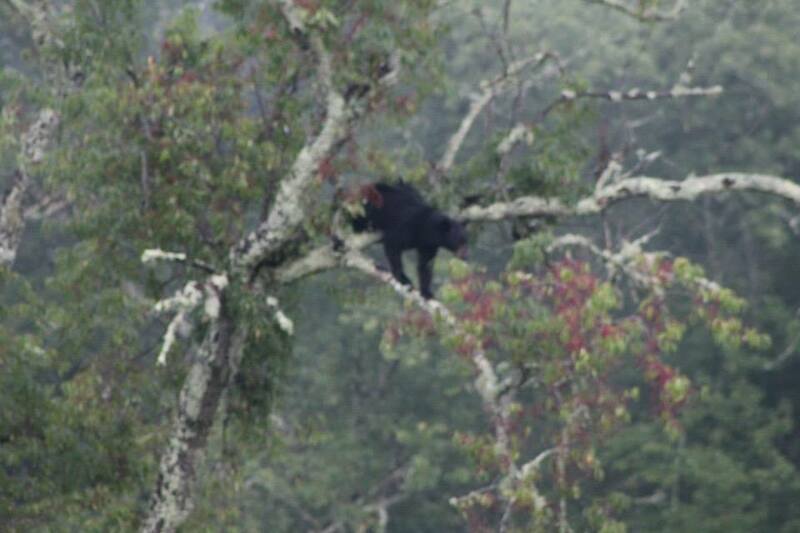 We found out later that a bear had been there only that morning. After a brief break we hiked on and took a side trail to visit Mt. 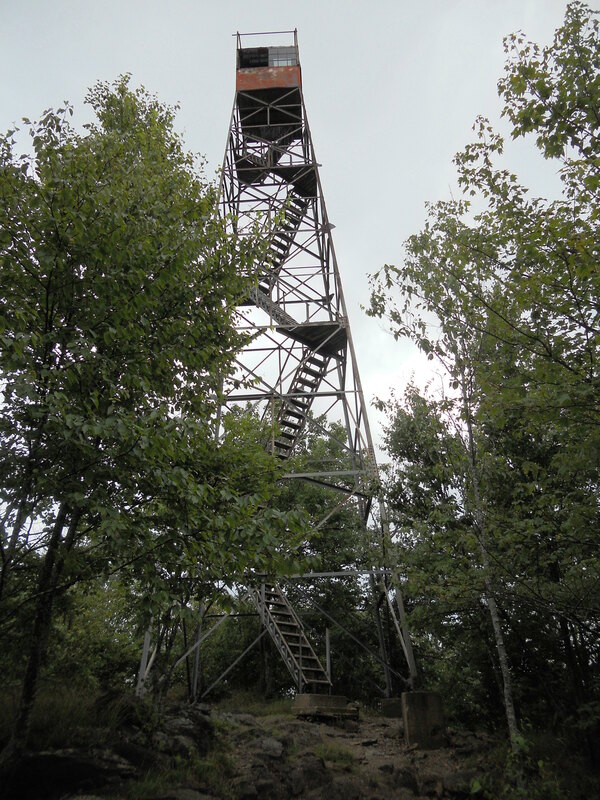 Cammerer Lookout Tower, a structure built on the side of a high point used as a fire watch tower earlier in the park’s history. Unfortunately, the mist that makes the Smokey Mountains famous arrested most of our views. But we still stopped for a snack and to enjoy the fleeting views we could get as the mist shifted. The fleeting view from Mt. Cammerer. 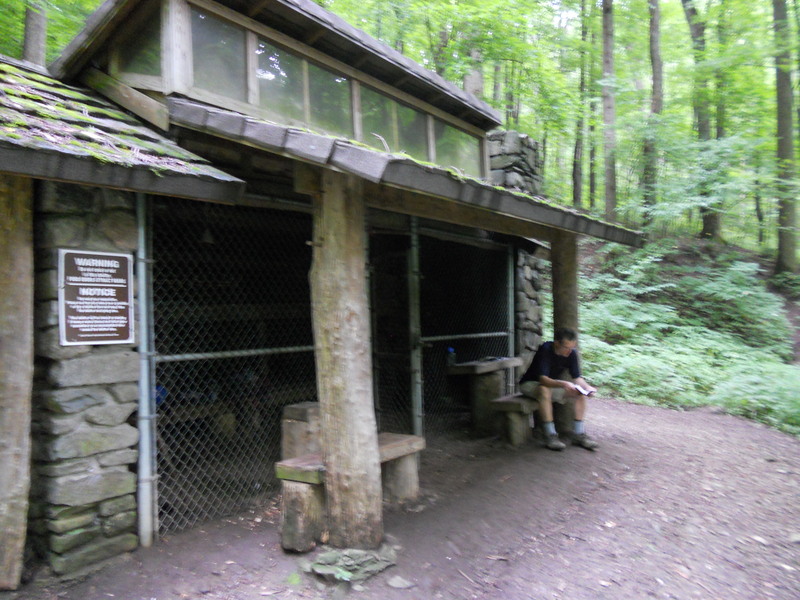 Finally we arrived at Tricorner Knob Shelter – the last arrivals at a very full shelter. Dad and I shared the shelter with 12 other hikers, including another father/daughter team from Bloomington, IN. 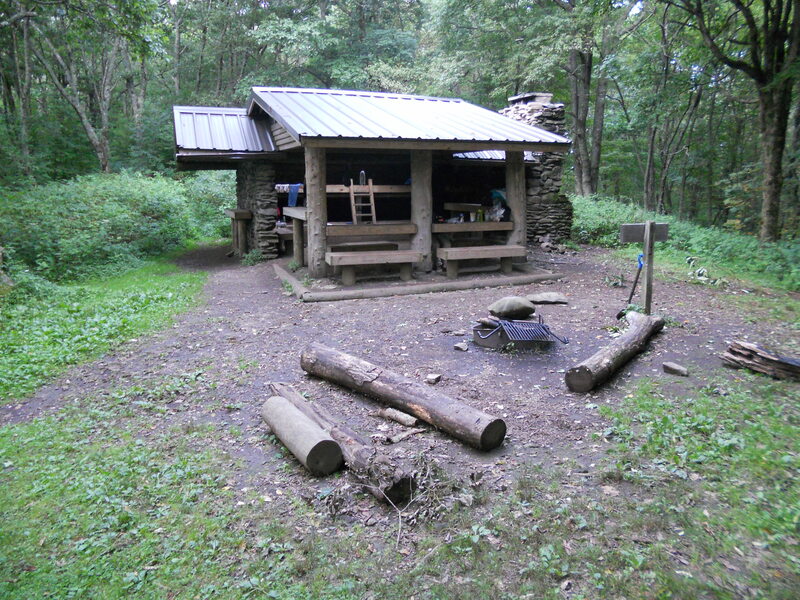 Tricorner Knob Shelter ended up being a favorite of mine due to the close proximity of all necessities to the shelter (privy, water, and bear lines). It was also sheltered in a cove that made it warmer than some of the later shelters that were up on the ridge. 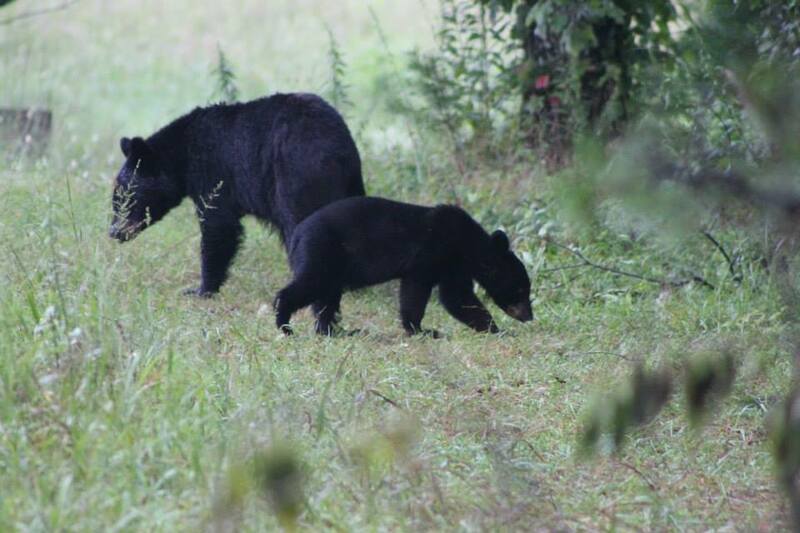 Dad and I awoke early Tuesday morning to… you guessed it – pouring rain. Great… a wet day. Dad and I got ready to leave and took a break in the rain as an opportunity to get started on the trail. Our routine was becoming an easy habit. Wake up with the sun, go to bed with darkness, and hike in between. However Tuesday was our easiest day, only 12.6 miles on the trail. Our destination was Icewater Shelter, located on the ridge with a great view. 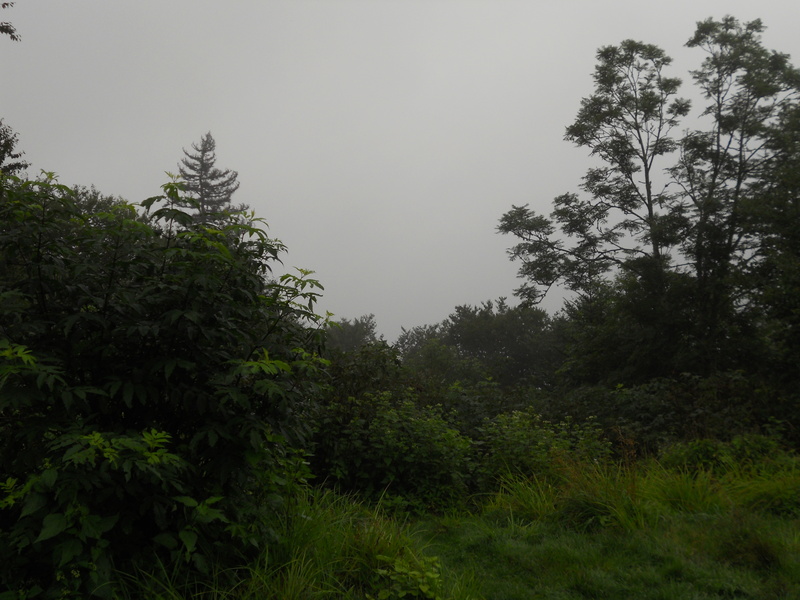 The day turned out to be a grey one with views of mist as we hiked the ridges. We attempted to stop for a snack break in the morning on a stone outcropping, only to be rained on shortly after arrival. It was one wet day. There is supposed to be a view…. Fortunately we did get a rain break for lunch with stunning views from Bradly’s View. We took our time and rested there, chatting with hikers that came by and enjoying a bit of sunshine! Unfortunately, my knee had started hurting, so the second half of the day was slow going as I tried to walk in such a way as to not irritate my knee more. 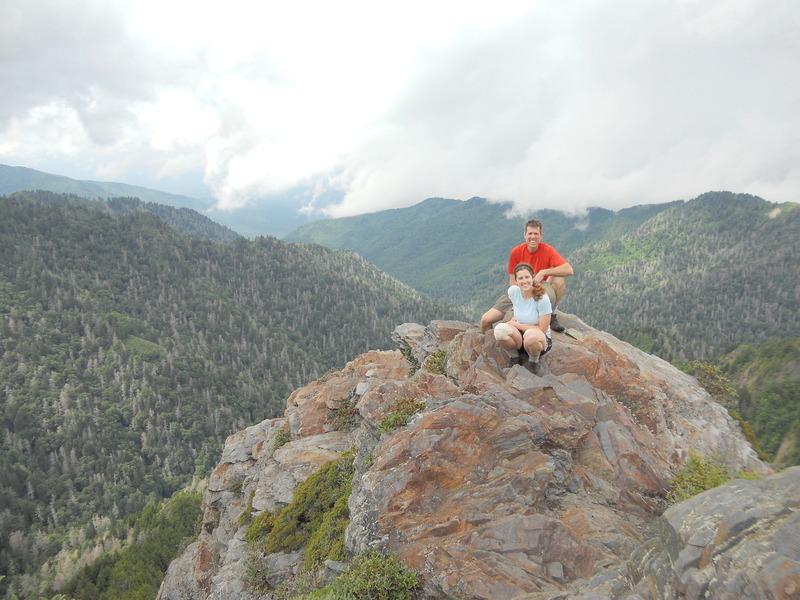 Late in the afternoon we arrived at Charlie’s Bunion, and we had a decent view of the surrounding area. The other father/daughter pair were enjoying the view and Dad and I got our first picture together! 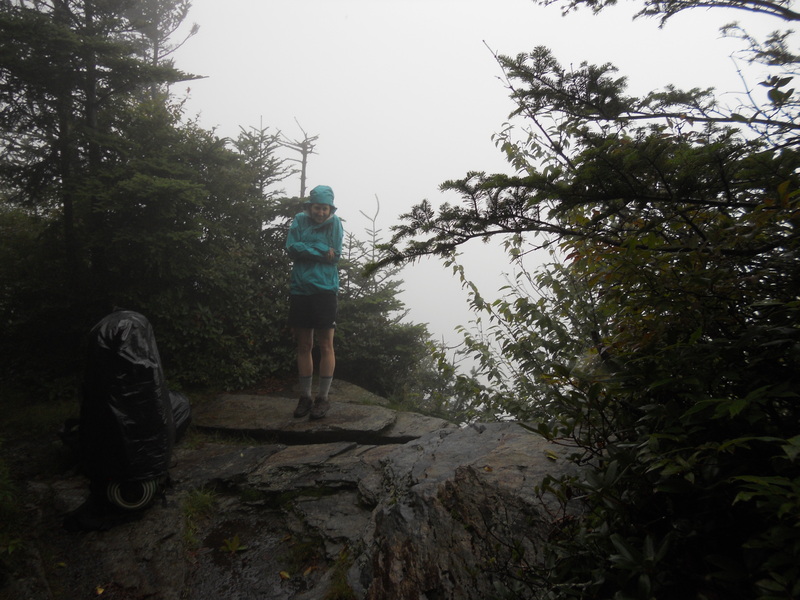 Icewater Shelter was just after Charlie’s Bunion, much to our relief, as the rain was moving in. And sure enough, within minutes of arrival it began to pour, again. 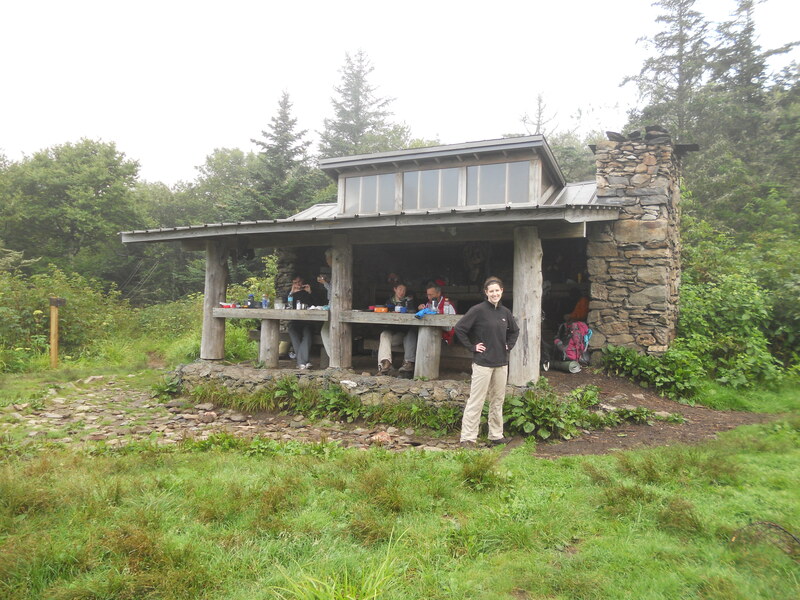 We were once again in a full shelter with 12 other people, an interesting mix of people on their first hiking experiences and section hikers who have been hiking the AT for years. 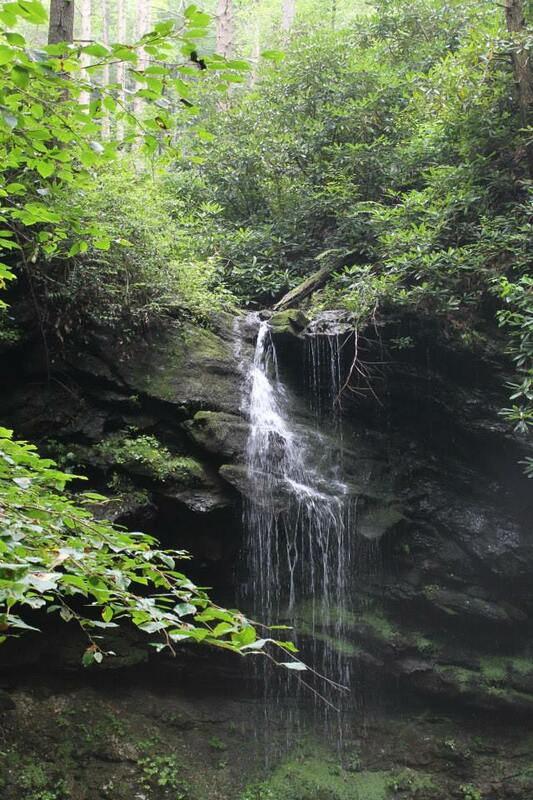 Because of the rain, we never saw the amazing views Icewater Shelter has to offer. Even the following morning, as we prepared to leave, the clouds still hung low on the mountains. After the break we started down the trail again into what became one of our favorite sections of the trail – the section between Newfound Gap and Clingman’s Dome. We weren’t on the ridgeline for much of this section, but we were walking through deciduous rainforests that looked just like the forests found in the Pacific Northwest. 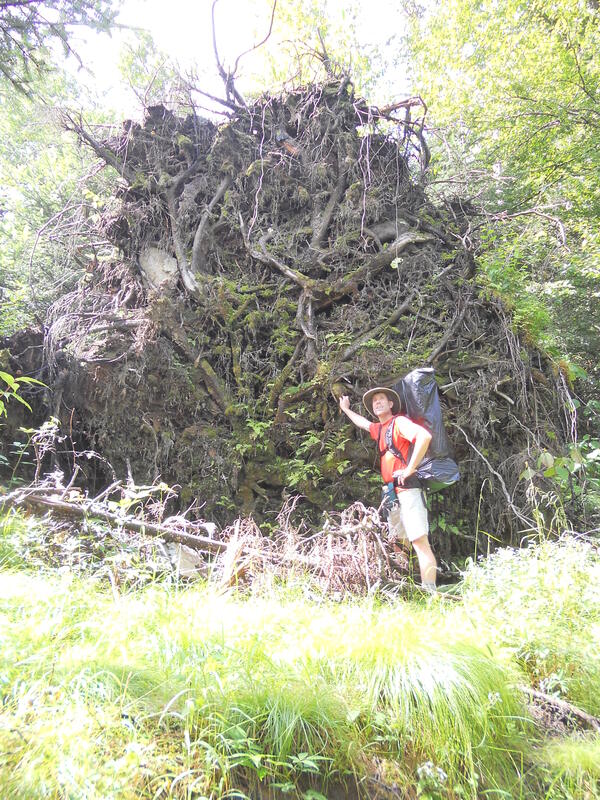 A tree that had been uprooted. 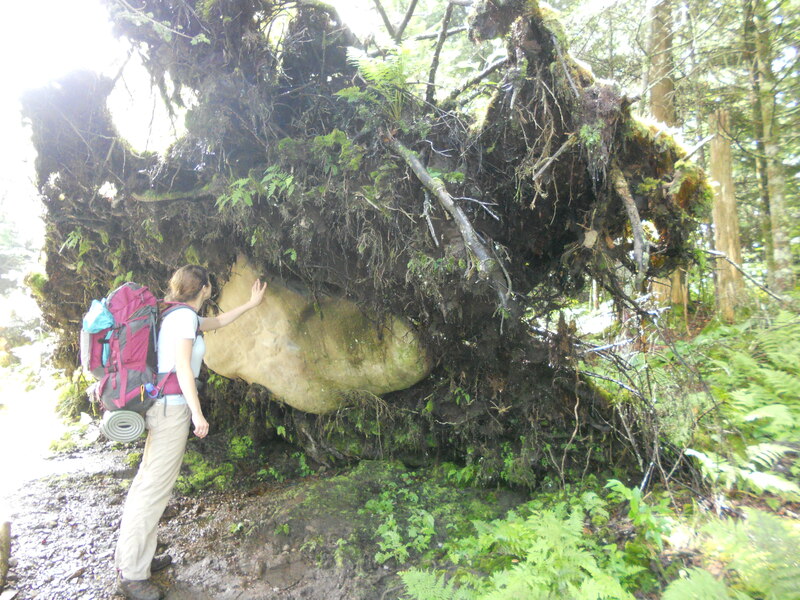 This tree took the rock with it. 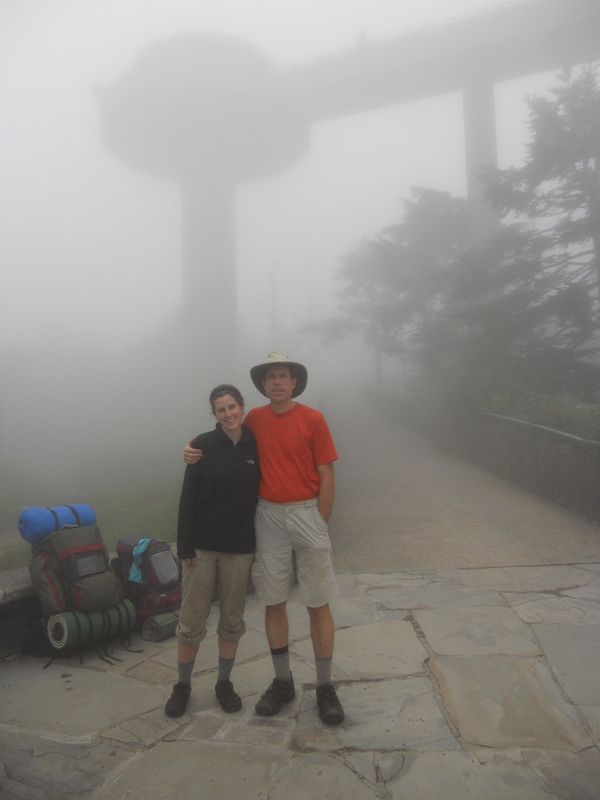 When we arrived at Clingmans Dome, it was shrouded in mist – so much so that you could barely see the base of the tower. So instead of climbing, we just took a break at the base to enjoy the, as Dad put it, United Nations stream of people coming the see the Dome. And to enjoy the stares aimed our direction as people wondered what we were doing with giant packs. And of course to answer curiosity questions from those brave enough to ask. Clingmans Dome… it’s hiding in the mist. 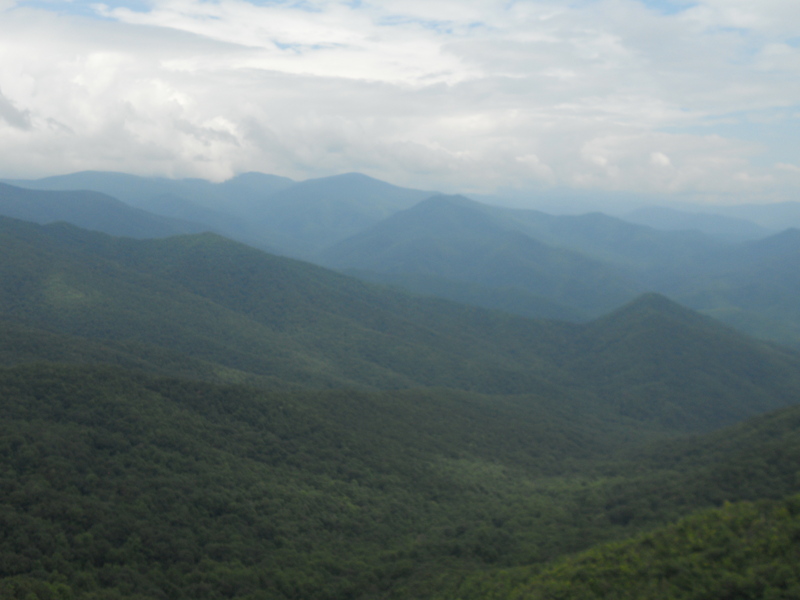 After that we took off again, heading to our final destination of the night – Silers Bald. This section of the trail was full of evidence of the wild pigs that have rooted up many of the mountain slopes in the region. 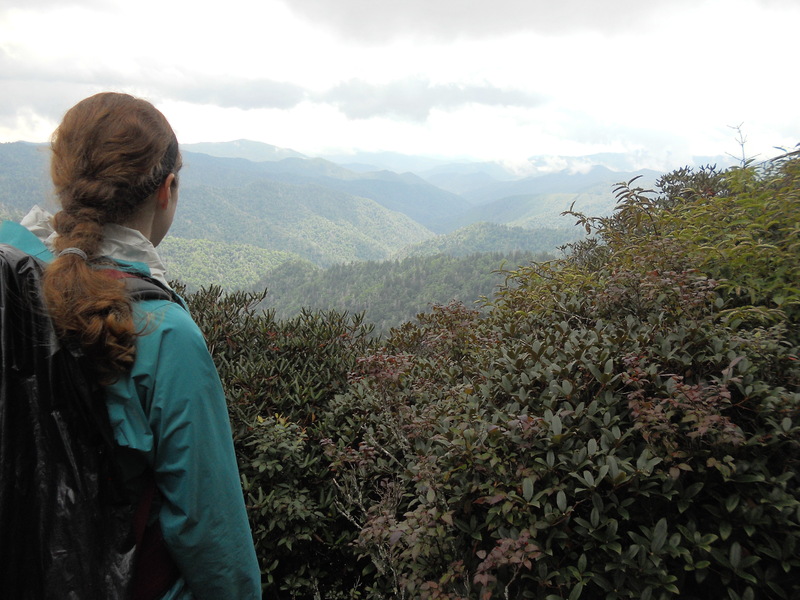 We also met a group of women who had gotten lost – they headed the wrong direction when leaving Clingmans Dome – and made sure they got pointed in the right direction. 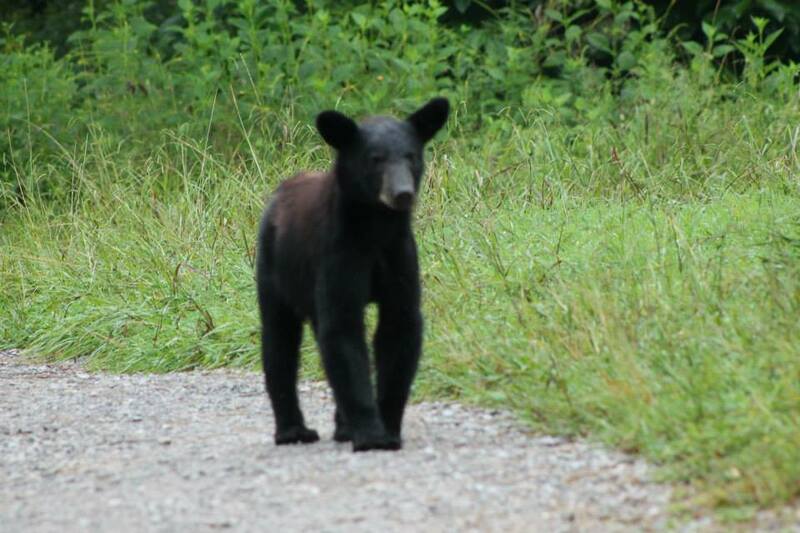 We had already noticed that since leaving Newfound Gap, there were fewer hikers on this side of the park. 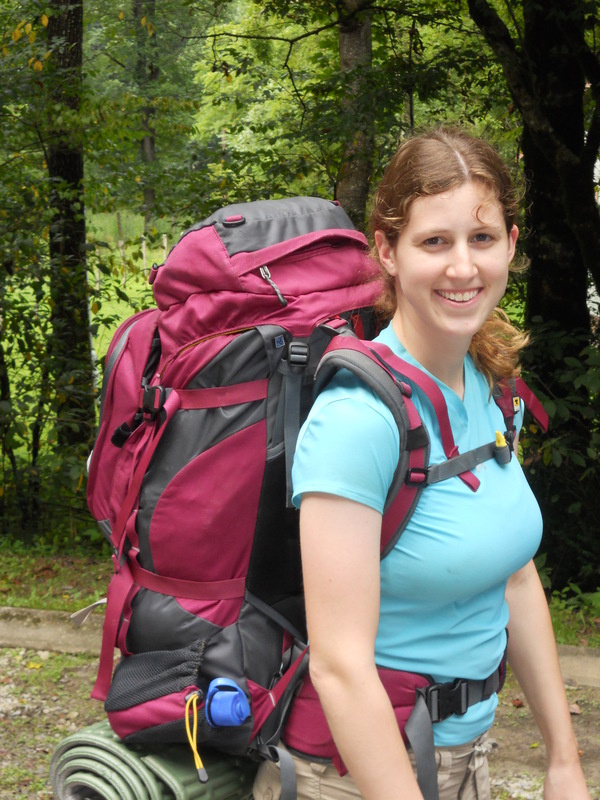 And most that we did encounter were day hikers. So we were anticipating a less crowded shelter for the evening – and we got it. In fact, we had the shelter completely to ourselves. Upon arrival we noticed that the temperatures were dropping, and a nasty, cold wind was blowing right through the shelter. Plus, we still had wet gear from the days of rain that really needed to be dried out. So we decided to gather wood and start our first fire of the trip. It was wonderfully successful. We were able to dry out socks and clothing, as well as stay warm from the wind until it was time for bed. Thursday morning dawned with mist and a chill in the air, so Dad and I got moving fairly quickly just to warm up. Today we would hit more ridgeline along Thunderhead and Rocky Top Mountains, and we were hoping the mist would clear out for the views. Unfortunately, we had some hiking to do before we got to the viewpoints, and much of this section of trail was destroyed by the wild pigs as well. 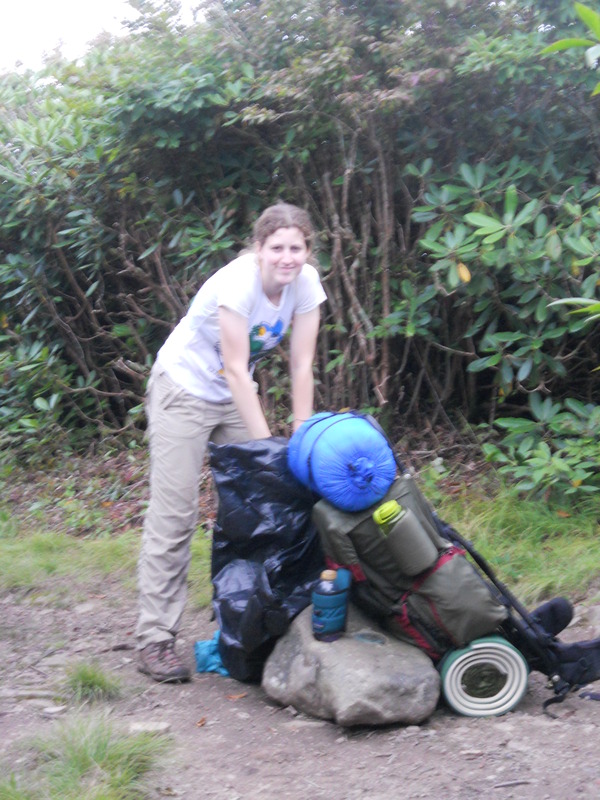 We took a break at Derrick Knob Shelter and enjoyed the – wait for it – SUNSHINE! Yes, the sun had made an appearance and Dad and I decided to bask in it for a while. 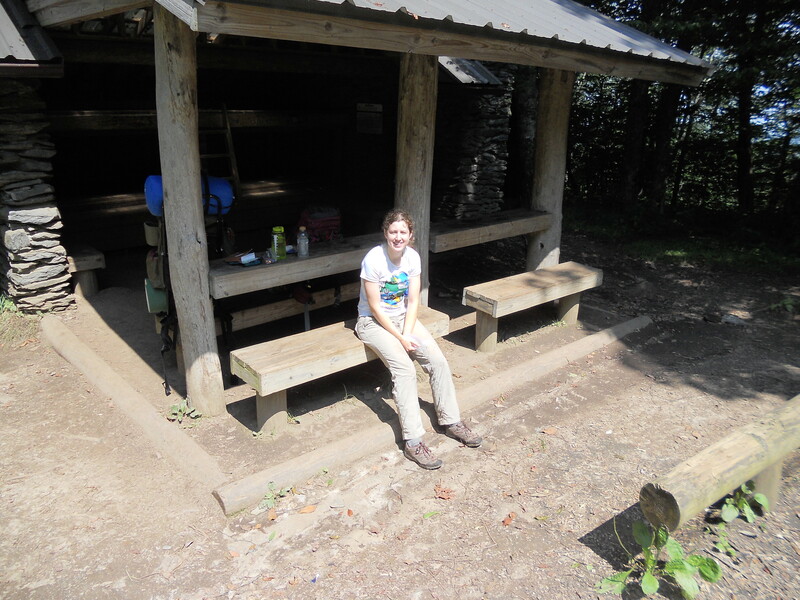 Basking in the sunlight at Derrick Knob Shelter. Apparently we were not the only ones coming out for the sunshine, as we made a friend in the form of a young male deer also out for a snack. While he decided to hang out for a while longer, we had to press on. 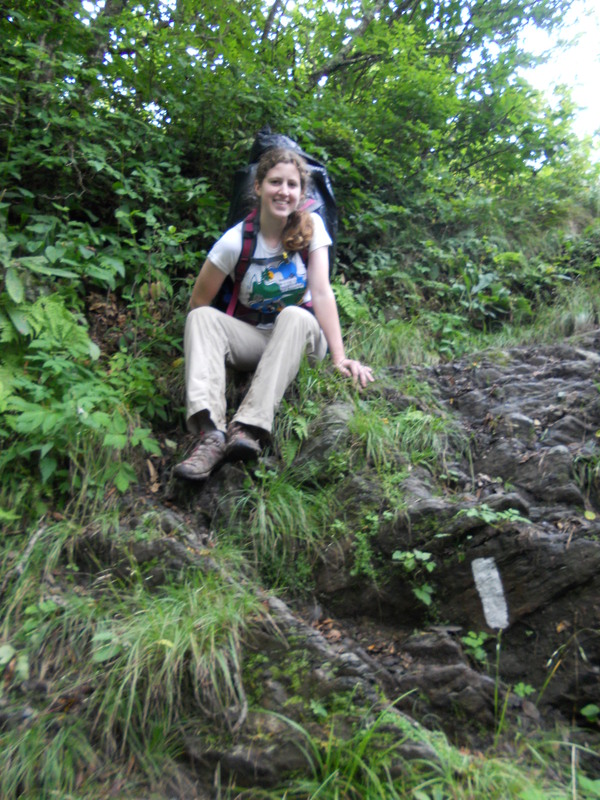 A steep section on the trail. 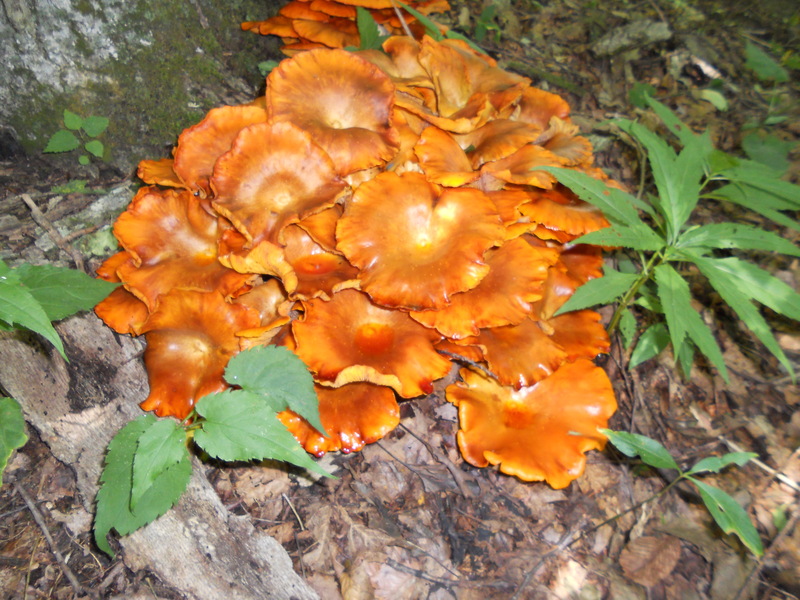 An interesting mushroom found on the trail. 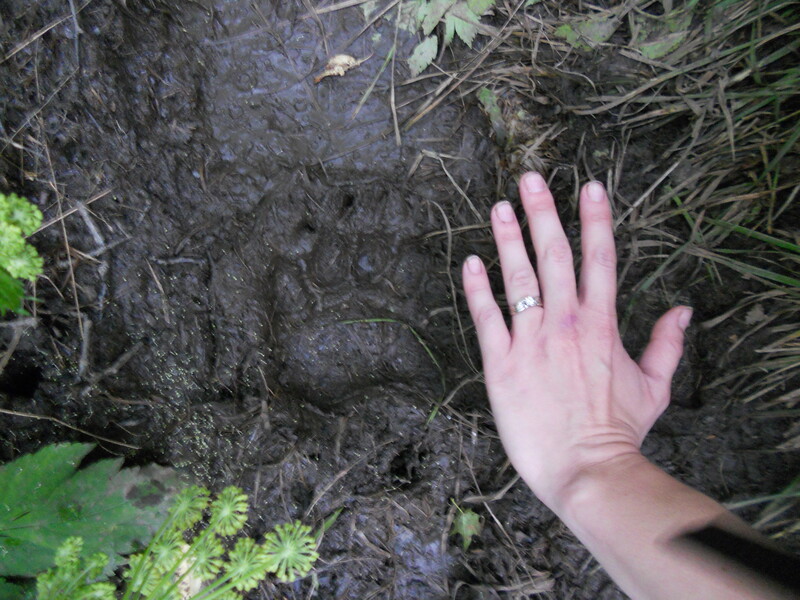 A bear print on the trail. 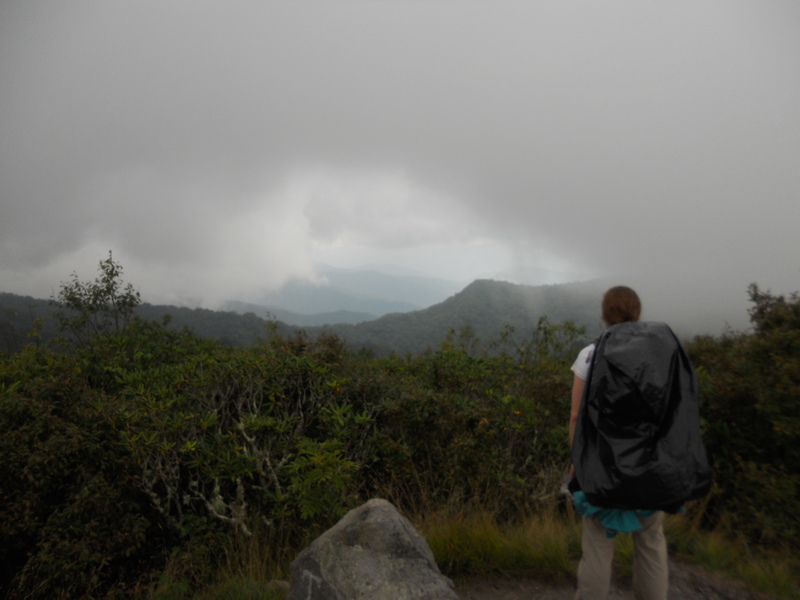 When we reached Thunderhead, the mist was moving in and the moisture was so thick in the air that raindrops occasionally fell from the mist. Thunderhead Mountain is now so overgrown with rhododendrons that you have to stand on a pile of rocks at the top just to see a glimpse of the surrounding landscape. 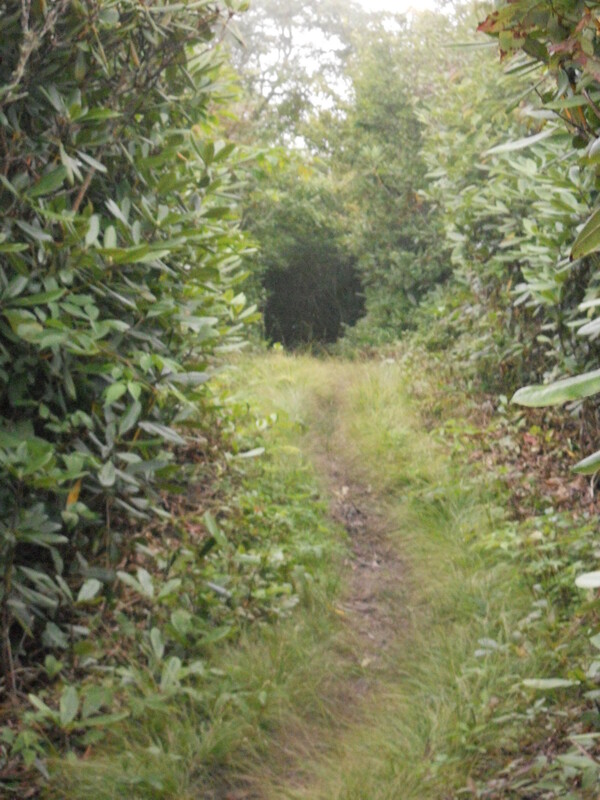 A rhododendron tunnel leading to Thunderhead Mountain. We made it…. I’m tired. The rock pile at the top of Thunderhead Mountain. 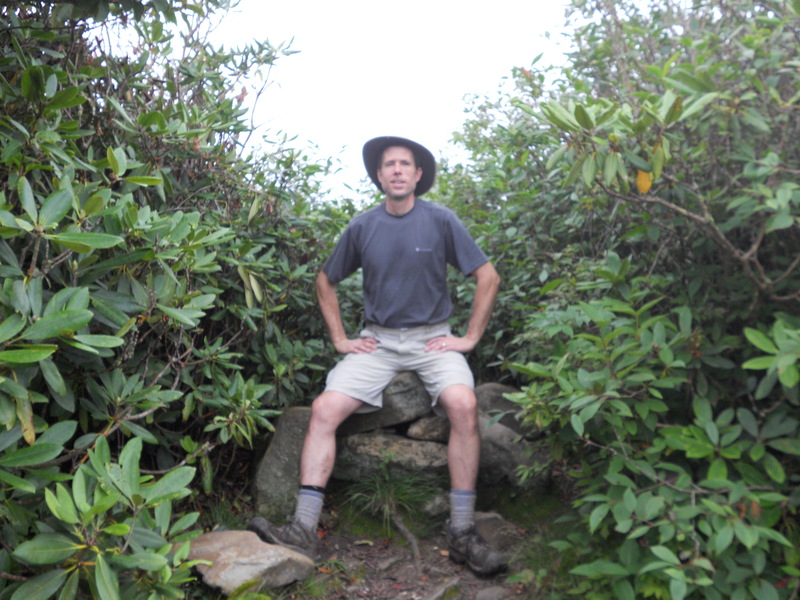 So we pressed on to Rocky Top where the vegetation is not so thick. We could see some around the mist, but we were rather disappointed that we had yet to get a completely mist free view on our trip. 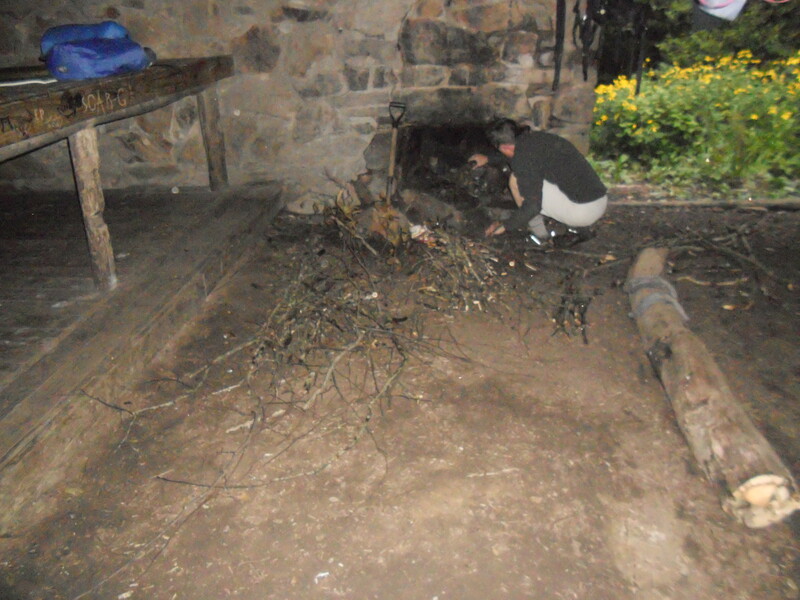 We did have a bright spot on our horizon – Spence Field Shelter had a privy! And we would pass the shelter that afternoon! Regrettably, we were planning to stay at Russell Field Shelter (about 2.5 miles past Spence Field Shelter), but we could still take a break at Spence Field. Which we did… and almost didn’t leave because by this time, we were a little footsore. But we pressed on, and upon arrival at Russell Field found a fellow hiker hunkered down in his sleeping bag looking a little scared. 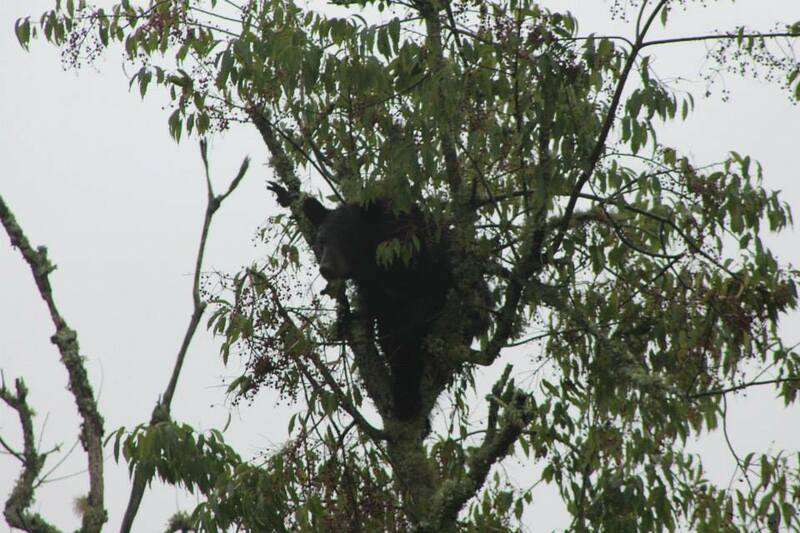 We quickly learned that a bear had come into the shelter not 5 minutes before as he was napping and had come right up to the hiker sniffing. 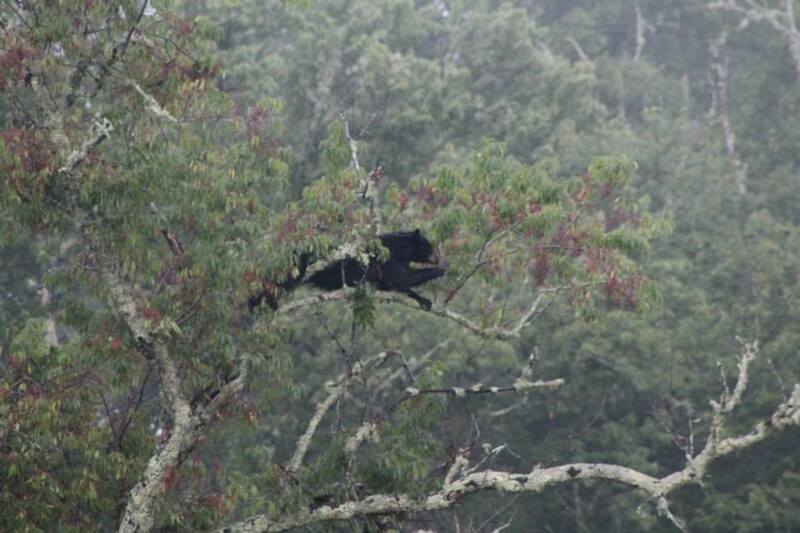 Needless to say, the guy was happy to have some other people around in case the bear came back for another visit. 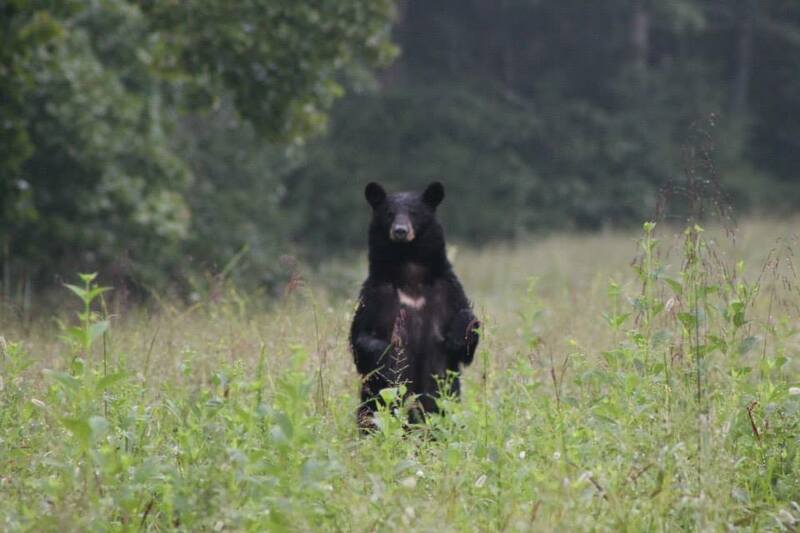 We were just disappointed we’d missed the bear. 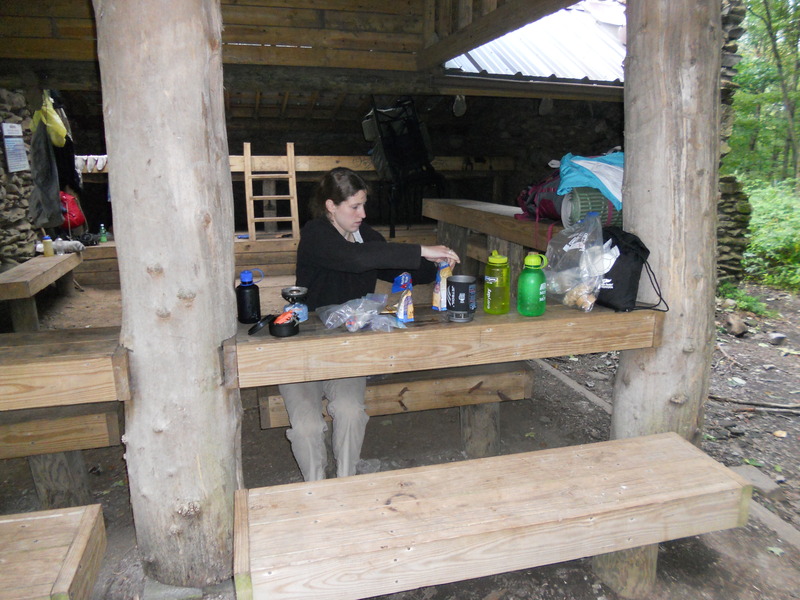 Cooking our dinner at Russel Field Shelter. Friday morning started pretty full of excitement. Tonight we were going to get real food! Just 13.5 miles and we would be done with our 75 mile trek! We set off full of energy and made good time to Mollies Ridge Shelter. 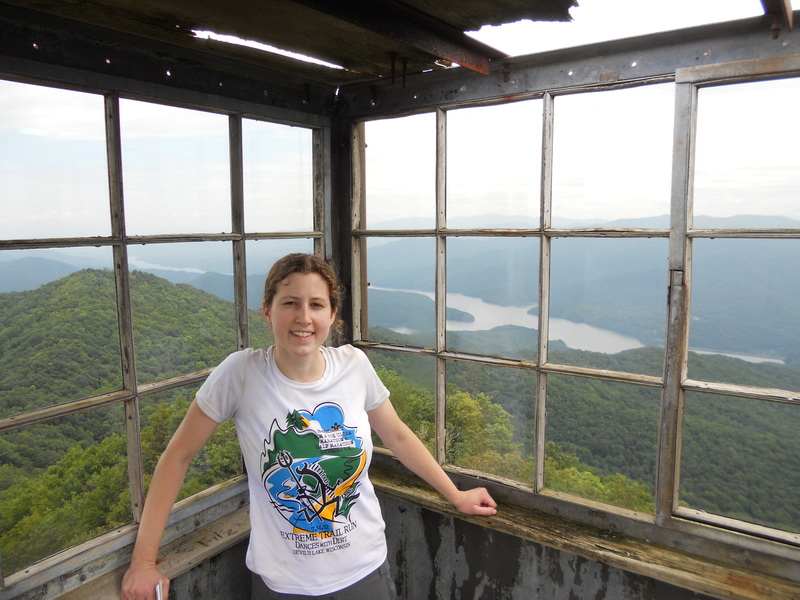 We took a break at Mollies Ridge Shelter, our last high point before descending to Fontana Dam. 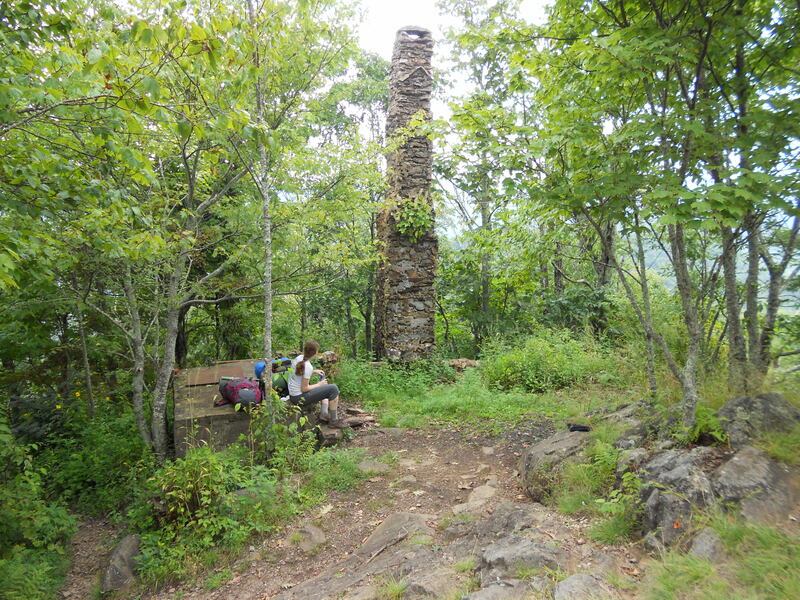 As we descended, we decided to take a short side trail to the site of an old fire tower – Shuckstack Tower. According to what we had read, it had been torn down, but the views were said to still be good. Much to our surprise, we found the tower still standing, and still climbable. So up we went – to enjoy the best views of our whole trip. 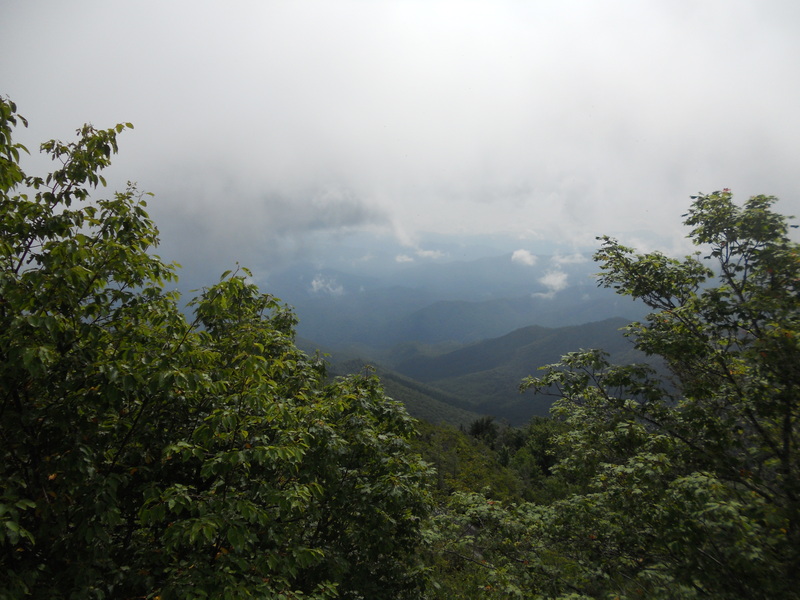 The clouds had mostly cleared out, and we could see a lot of the ridge we had just hiked in the past few days. 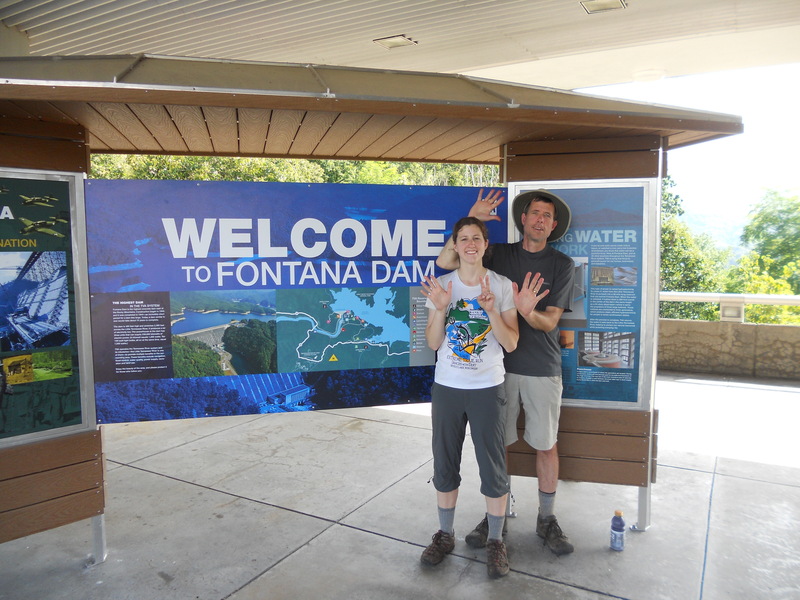 We could also see down to Fontana Dam – our ending point. The top of Shucksack Tower. 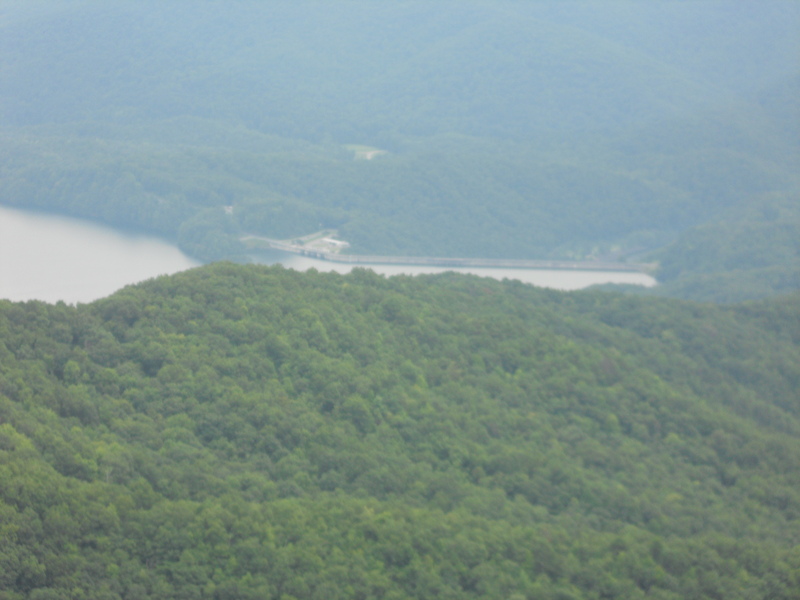 Fontana Dam from Shuckstack Tower. 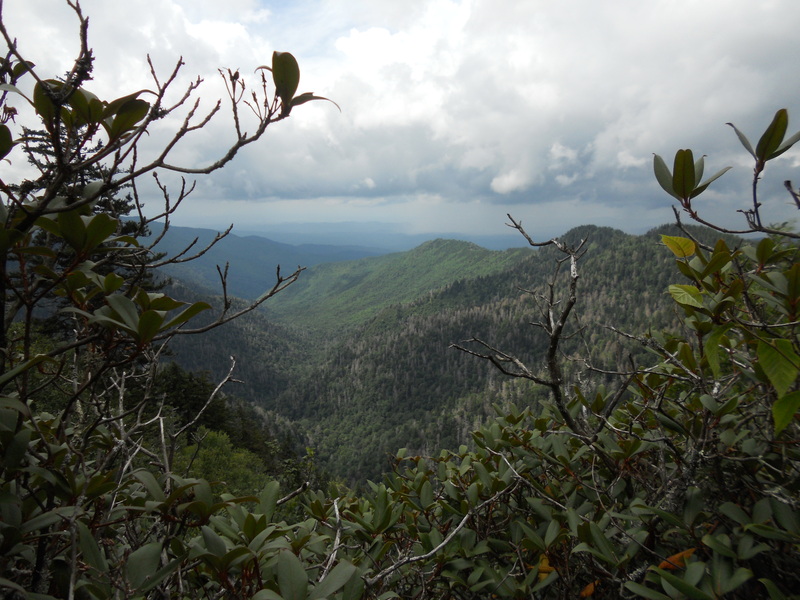 A view over The Great Smoky Mountains National Park. 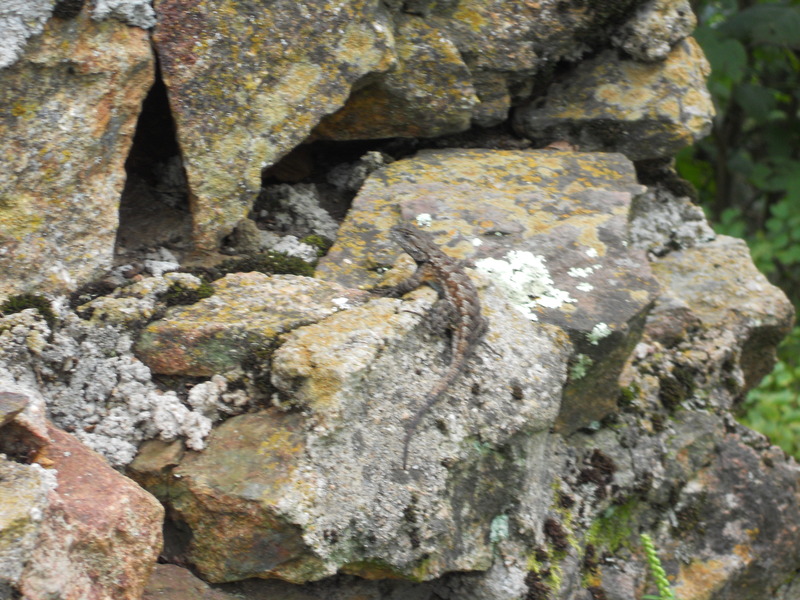 We also found a lizard hanging out in the chimney of the old building that once stood beside the tower as a place to house those stationed there. The remains of the structure that stood beside the tower. Well now that we could see our destination, we were ready to tackle the last of the trail. So down, down, down, we went. 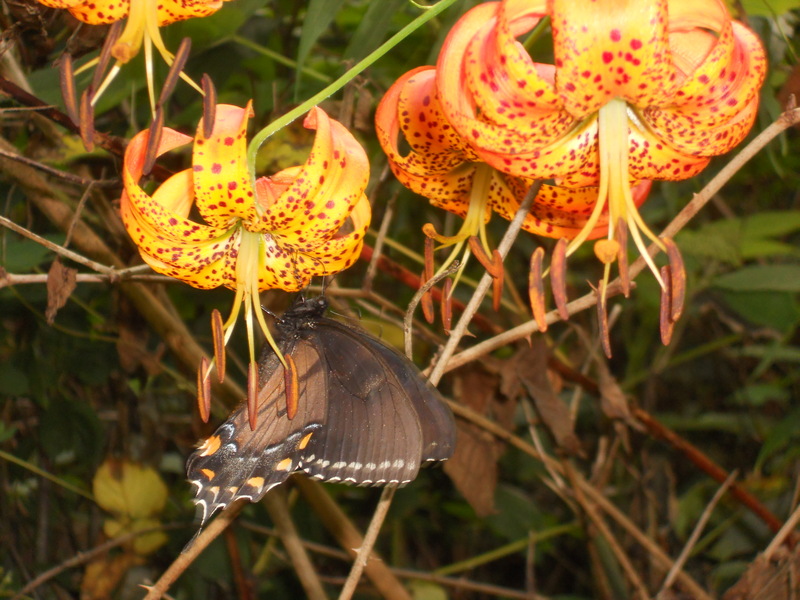 The pretty butterflies on the flowers. The trail ends at a road, that you can drive, but we had decided to walk it to the dam so we could walk across the dam as our last piece of the hike. 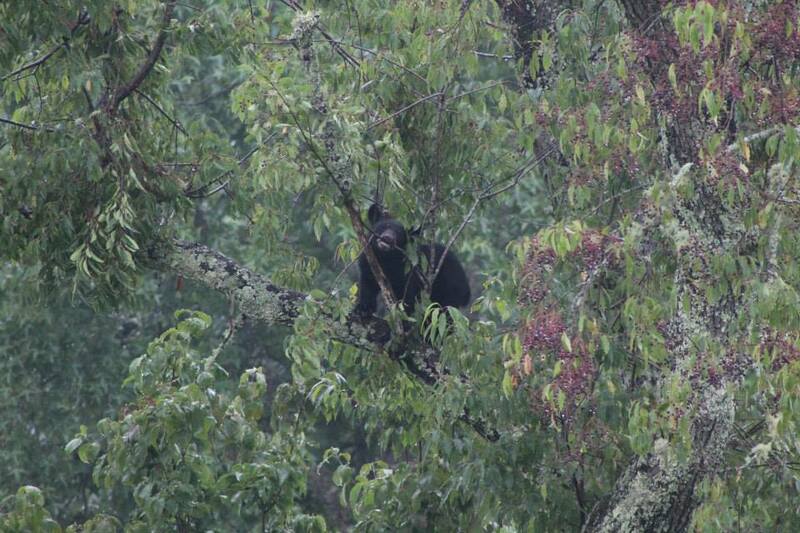 As we hiked along the road, just before we reached the dam, we finally saw the bears we had been waiting for all trip. 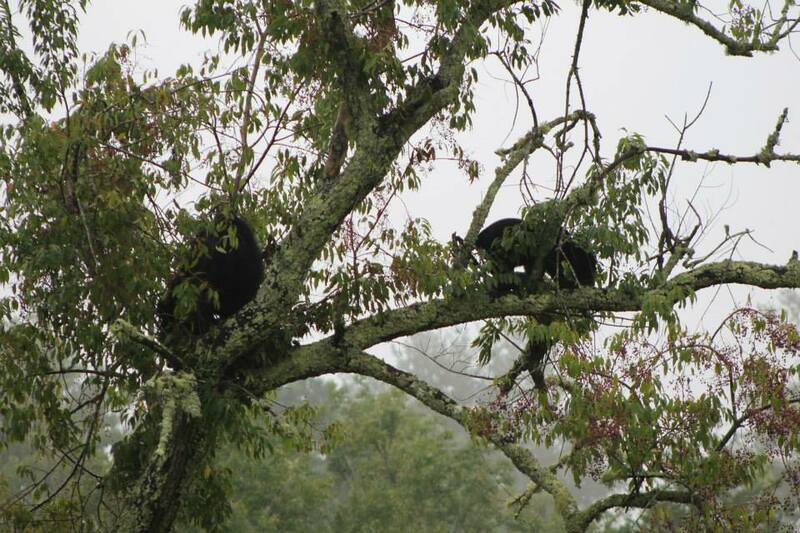 Two bear cubs ran across the road and down into a ravine. They were too fast to get pictures of, but it was a cool way to end the trip. Dad and I on Fontana Dam. We reached the end! And of course mom was there waiting on the dam for our arrival. And with a car, so I could stop walking. 75 miles in 5 days!